Agnieszka Holland’s The Secret Garden is the second film version of the beloved Frances Hodgson Burnett children’s novel about a young girl who’s sent to live in the English countryside after her parents die in colonial India. The first was directed by Fred Wilcox at MGM in 1949, in glistening black and white and (in the garden sequences) the intense storybook Technicolor we remember from The Wizard of Oz and Meet Me in St. Louis and National Velvet. Done up in the lavish MGM bound-classics style, it’s a handsome production that provides a deluxe Gothic mansion, a stunning carriage ride through the moors in a heavy evening rain, and – best of all – the formidable child actress Margaret O’Brien (the morbidly fanciful Tootie of Meet Me in St. Louis) as contrary Mary Lennox. Though Wilcox’s technique is a trifle shaky (the camera’s not always in the right place), and the late scenes drip into melodrama, the movie is highly satisfying. The MGM adaptation takes its tone mostly from the conventional scenes, Holland’s and the screenwriter Caroline Thompson’s from the odd, gnarled, repressed Victoriana. These two women miss the rhymed elegance big-studio Hollywood could bring to the story – the velvet-and-chocolate cream classiness. The scenes that center on the embittered, widowed hunchback, Lord Craven (John Lynch, looking constipated), are soppy, convictionless. But the filmmakers get the sweet-and-sour mood, the emotional clarity of the children’s exchanges, and the tart comedy they make together. 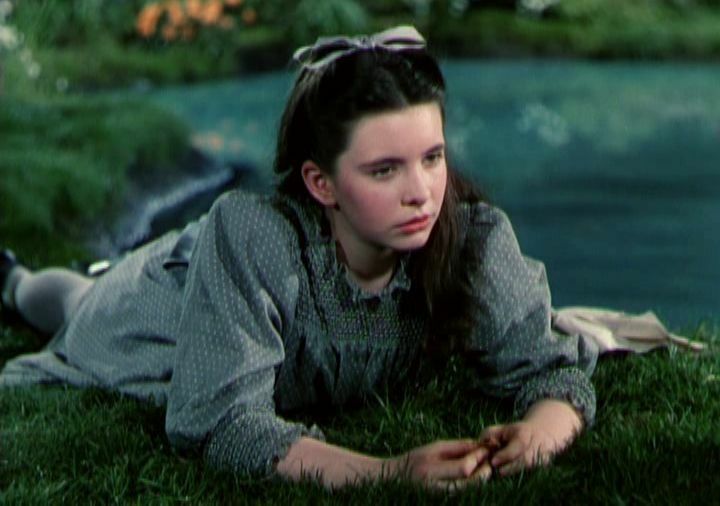 Margaret O'Brien in The Secret Garden (1949). As Mary, Kate Maberly has huge eyes and long, straight hair that shoots down her back like a muddy shower. Her usual expression is glowering expectancy, followed by a torrent of fury – entitlement mixed with continual disappointment. But when she’s stirred, her eyes flicker with clandestine curiosity, which she douses the moment an adult appears. (The nearness of a grown-up is like a corset wound around Mary: immediately she burrows insider her dress and grows sullen and fugitive.) Heydon Prouse’s Colin has a dainty, porcelain face, but there’s a spirit alive inside it; the boy is practically chained to his bedchamber, but that face is hyperactive, as if it were his body’s only way of signaling how much he yearns to be set free. When he and Mary meet, they have to gnaw and scratch their way through all those remembered years of loneliness and distrust before they can find out they’re soulmates. You’d have to go back to Cocteau’s Les Enfants Terribles to find a relationship of two children that’s as bizarrely funny as this one. And standing calmly in the background is Dickon (Andrew Knott, more of a presence than an actor, but extremely effective), an emblem of the natural world Mary and Colin learn to inhabit. 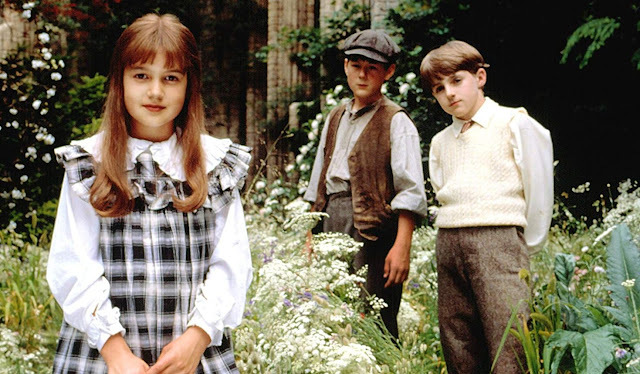 Holland’s Secret Garden is different from the other children’s-story films I love; it’s thornier, with comic scenes where you don’t expect them, and the humor hisses like a punctured blister. That’s Holland’s kind of humor; you’re meant to cackle at it. The movie might be very hard to take if it didn’t have so much feeling in it; that’s how Holland takes the chill off a cruel world. What you miss in The Secret Garden, though, is the sensual transport of Carroll Ballard’s The Black Stallion or Irvin Kershner’s The Empire Strikes Back or Steven Spielberg’s E.T., movies that sweep everything up in them like cyclones. It’s the element that separates Holland from the magic-carpet filmmakers who seem to operate purely on instinct, as if the camera were an extra limb or a sixth sense. Holland is all idea and skills; you can hear the clicks. The movie isn’t sorcery, but it’s worked out with remarkable intelligence.